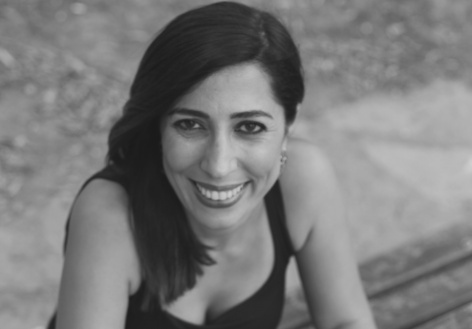 to hear that our dear friend and colleague, journalist, writer, human rights and peace activist, and mother of two, Nurcan Baysal was detained by police from her house in Diyarbakır, around midnight on Sunday night January 21, 2018 as part of the operation launched by Diyarbakır Chief Public Prosecutor’s Office into posts on the social media about Afrin operation. Numbers are varying according to different sources, as far as we have come to know Nurcan is among 57 people detained in Diyarbakır. Turkey’s silencing of voices who speak out against war is in violation of its own laws and obligations under international human rights law. We hope that Nurcan will be out of police custody and home, with no charges, immediately. 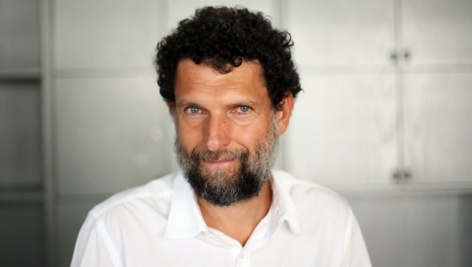 Osman Kavala, the chairman of Anadolu Kültür, made a statement through his lawyers. As it is public knowledge, I was arrested on 1 November 2017, and I have been in Silivri Prison for more than two months. When I was taken into custody on board returning from Gaziantep, I was not worried. I counted on that it would be understood immediately that the suspicions against me are unwarranted. Yet, my arrest and the accusations that led to my arrest came as a surprise to me. The accusation that I am the organizer of the Gezi events includes the allegation that I have provided financing. As one may remember, after the events of Gezi, allegations were made that these events had been outsourced and financial resources had been provided from abroad. In a newspaper article dated 2014, it was also mentioned that there had been an intelligence note that relates me to the Gezi events. Later, the person conducting the investigation on this issue was arrested in 2015 and is still detained. As a result, until now there has been no discovered evidence about these unfounded allegations; and I am the only one to be arrested on this issue. On the grounds of the arrest, I have especially found odd the allegations that have linked me to the Gülen movement and the July 15 coup attempt. I am astounded by the fact that such allegations are laid on me, while I have always been against coups throughout the course of my life and tried to draw public attention to the negative impacts of the presence of Gülen community within the state for years. In any case, as a person who experienced September 12 and never forgot the terrible memories of those days, it is highly insulting to me that I have been associated with such circles. I would like to point out that I have resorted to legal measures in this regard. I believe that it will soon be understood that these accusations are unfounded. Nevertheless, I think that the state of emergency also affects the climate in the judiciary, and that the arrest decisions may be reflecting this effect. In times of state of emergency, the concern for losing the suspect outweighs the need for the prevention of engendering unjust victimization. While the people who were unjustly arrested are expected to be freed as soon as possible, the psychological impact of the initiatives that violate the presumption of innocence, such as the recent preparations for the regulation on the uniform dress code, is not taken into account. Despite everything, my belief is that the new year will be a better year in terms of democracy and freedoms. When I woke up this morning, I learned that Osman Kavala, a leading civil society leader and a prominent businessman, had been detained. You already know a lot about him, I would like to tell you some things that you may not know. I met Osman Kavala 16 years ago during my work in civil society. Osman Kavala was supporting the women’s rights work that I was very active in. Throughout the years, I took part in many cultural activities and projects that were organized by him. For many years, I have witnessed his efforts to bring people from different views to the same table from Kars to Muş, Diyarbakır, Antep, Antakya, Mardin, Erivan, Mid Anatolia, Çanakkale, Bursa… He not only invested in culture and art facilities but also in activities supporting children’s rights, poverty, development, the rights of LGBT’s, the peaceful solution of Kurdish and Armenian issues, democracy, freedom and establishment of justice… He has done a lot for this country. Osman Kavala founded Anadolu Culture which has supported local artists all over Anatolia and has contributed to the revival of local cultures and established cultural bridges between different cities, cultures, societies, languages… For many years, they have supported children’s activities, organized art workshops for the children affected by war and supported the establishment of cinema clubs in universities. While hundreds of thousands of Yezidis were fleeing to Turkey because of ISIS attacks in the summer of 2014, Osman Kavala was again there to support the establishment of Yezidi camps in the Region. After a lot of work, we established a school together with him in the Diyarbakır Yezidi camp. The needs of the school, the school books, motivating the teachers… I am telling you, this man dealt with them one by one. When the wood for keeping warm, food or clothing ran out in the camps, Osman Kavala was the first person we called. I am telling you, this man paid such close attention to the kinds of tents we bought, and the wood we chose to ensure we kept the families warmest. Also he did the same for the Syrian refugees. He is always there when there is someone in need. I am telling you, this man has done his best for the Syrians, Yezidis, Turks, Kurds, Armenians, Assyrians, for all the nations, societies, for all the people. As one man, he has contributed enormously to the development of civil society in Turkey. Many times I thought that if we had a few more Osman Kavalas, the civil society of Turkey would be in a different place. Osman Kavala is also a good friend. His friendship makes you trust and believe that another life is possible. He is so warm hearted, gentle, helpful and honest. He could never see harm come to another human or living thing. Osman Kavala is a good man. His detention shows that this is a war between goodness and evil. Surely, goodness will win! Is Şırnak one of the 81 cities of Turkey? In the last couple of weeks, İnsan Hakları Derneği (Human Rights Association) Diyarbakır Branch has published an important report on human rights violations between the dates July 24, 2015 and July 24, 2017, which attests to the atrocities faced by our society in numbers. – 771 security personnel and 1307 armed militia died in armed clashes. 51 people were caught in crossfire and died. – 448 people were killed as a result of extrajudicial killings by soldiers, police or village guards (korucu). Most of these deaths took place during the curfews imposed. 75 of them were children. -14 people died as a result of armored cars hitting them. – As a result of armed groups actions, 129 people died all around Turkey, 64 of whom were living in Kurdish cities. In Kurdish region, 14 people died after being detained by armed militia or due to attacks committed by them. – 15 children died due to mines or residues from armed clashes. 56 people died due to fire opened at people near the borders. In total 2891 people died. 2891 lives lost, 2891 hearts stopped beating! Those injured can go up to 3000. The report also includes the curfews declared and special security regions designated in the past two years. A total of 4842 days under declaration of special security regions. Curfews declared were not even calculated in days. Today marks the 647th day of the declared curfew over Sur, where I come from. You can imagine the rest. In the “practices related to funerals of militia”, one reads about all those cemeteries destroyed, corpses that were never given to the family of the deceased, or those that were exposed naked to the public. When you add up the villages displaced, forests burned, people tortured, detentions, arrests, house raids; violations against the right to organize, the right of expression, economic and social rights- you can see the horrible mess we have been in for the past two years. It is important to recognize that these violations and atrocities are just the ones identified. It is noted that this report should be considered as a MINIMUM since there can be cases out there that have not been identified yet. In the preparation of the report, only the formal counts were used. It is underlined that military and militia death numbers are actually higher than the reported numbers. Those warmongers are the cloaked ones, politicians, writers, and the media… Think for a minute about what war really means, do you really have a sense of what it means? It is clear that you are very eager to experience it, then go ahead and get in the frontlines and let the young live! 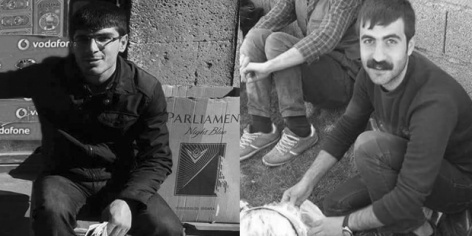 This is the story of İsa Oran and Mesut Seviktek, whose dead bodies were left lying on the ground for 29 days in Suriçi, Diyarbakır because they could not be retrieved. Let me first of all say this; I am writing this article so that what happened will go on the record; so that what has happened in the Turkey of 2016 will not be forgotten, in order to ensure history records it! I met İsa Oran’s father Mehmet Oran and Mesut Seviktek’s older brother İhsan Seviktek on December 30, 2015. I was organizing the program for Defenders of Peace in the city; 106 people from the initiative including intellectuals, artists and individuals from various vocational groups had come to Diyarbakır. A young woman came to me, she was crying. She said there were two dead bodies on the street in Suriçi, and their families were devastated and asked for our help. Making an addition to the program, we organized for the families to talk about what happened at the Defenders of Peace meeting that day, and again the same day, we visited the Governor of Diyarbakır as a group of intellectuals to ask for his support to retrieve the remains. Let me summarize what happened afterwards: I met with the families almost every day, anyway just a few days later the families went on a hunger strike at the Diyarbakır branch office of Human Rights Association (İHD). In the meantime, while trying to bring the issue to the public agenda, we kept going from door to door for support with the President of İHD Diyarbakır, Raci Bilici. We rushed from pillar to post between institutions. We were told that the bodies were in the garden of Yavuz Sultan Selim School and security forces could not go inside, that it was behind the trenches. Finally, about ten days ago, we met with the Governor of Diyarbakır again, and agreed on a plan that the curfew be lifted for two hours, and the special ops to retreat for that period so that with the municipality’s funeral coach, the families and a group of civil society representatives could go and retrieve the remains. In the meantime, during our Ankara visit two weeks ago, we conveyed the situation to Prime Minister Ahmet Davutoğlu and Ministry of Interior Affairs Efkan Ala as well. You know what took place afterwards from the press anyway. On January 12, the curfew was lifted for two hours. Even though it was said that the special ops would retreat, when the group went to Suriçi there were hundreds of special ops around, then the conflict intensified, and families had to leave Suriçi without being able to get the bodies. Something the security forces told the family and the group that day surprised me and many people. It turns out there were special ops inside the school where the bodies lay anyway. That is to say, the remains were in a place where there were special ops to begin with! While the families continued the hunger strike, two days ago, the prosecutor’s office calls Diyarbakır İHD and says that the bodies have been brought to the morgue and the families should come to the morgue to identify the bodies. The father Mehmet Oran and brother İhsan Seviktek go to the morgue to identify the bodies. To tell you the truth, I am astonished, angry, enraged and in pain. I was personally involved in this, I still haven’t been able to make sense of why they made us struggle for days to get the remains if the security forces had them in the first place or if the bodies were somewhere they could get them; what their aim was in doing so. The families had anyway thought the state had the bodies from the outset, how naïve I was! How naïve I was as we were planning how and from which street they could be brought, how I was waiting with some shred of hope every day, thinking okay, they’ll be retrieved today! How naïve I was beating at the door of the state for days! “Look, this is the outcome. For months the state bombed the martyrs’ graves, it did all in its power to the graves of Kurds, and then it boiled the problem down to the issue of trenches. What did you think would happen after you bombed so many graves, did you think the Kurdish youth would meekly accept all that was done? There were no trenches then, why did you bomb the graveyards? “The mothers of police and soldiers should see these sufferings too. Look I am saying this in my pained state. We are sad if soldiers die, we are sad if police die. I am calling out to the families of police and soldiers. Don’t say ‘all for the sake of the homeland’ over our children, if you are thinking about your dead child work for peace. Empathize. Mesut was my brother. They killed him, that wasn’t enough, they riddled him with over a hundred bullets. We are still saying let these be the last ones. Let our children be the last victims of the Kurdish people, of the Turkish people. Don’t let your children be sacrificed to this dirty war. Where were these bodies for one month? Who did this to these bodies? Will those who did these to these bodies be punished? During the nights following the 28th of January, when the ‘popular committees’ took over the security of the Egyptian streets, each came up with a password which one needed to say in order to be let past. Astonishingly, the one chosen by the committee, which was securing my own street was “Do you know Amr Ezzat?” When I was asked this question on my way home for the first time from the Tahrir occupation to take a shower and change my clothes, I answered affirmatively, with a half-smile. But surely not every Amr Ezzat is the one I know. I didn’t know the neighbour whose name became synonymous with the street in a moment like that, but I knew very well the activist/writer/blogger/journalist who would become one of the figures of the betrayed Egyptian revolution, and, in my opinion, one of its most important torchbearers. For Amr Ezzat to become the one I know, he had to diversify his education, starting with engineering, where he encountered the various existing (or potential) intellectual and political currents in the Egyptian society at the turn of the century. Engineering wasn’t the last destination , since his calm reflection was thirsty for philosophy, which he ended up studying. His religious inclination in his early twenties pushed him towards learning jurisprudence and sharia through the religious “institution” formed outside the realm of the Egyptian State. 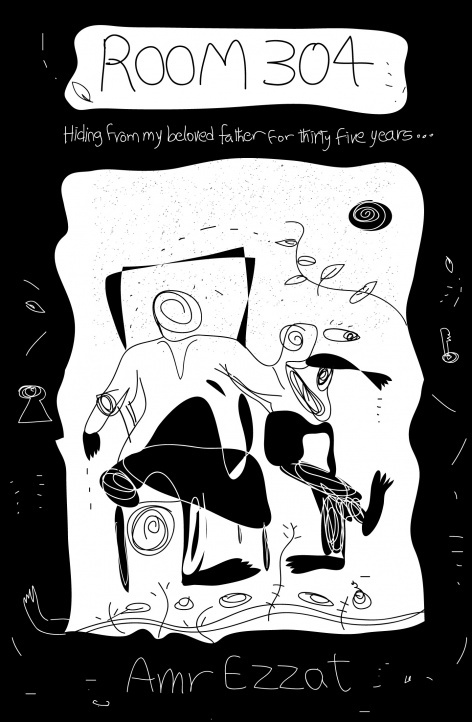 For Amr Ezzat to become himself, he had to engage with the communication revolution of the early 2000s; he had to blog, and the title he chose for his blog had to be so personal, idiosyncratic, simple and free as it is: Ma Bada Li (What seemed to me). He only writes what seemed to him. Is writing anything but that? Despite all the masks the writers hide behind? Yet another (parallel) link to ICT and social change: Having graduated from the Faculty of Engineering, he had to travel across the country – cities, towns and countryside – to follow up with the structural safety of mobile phone’s station’s facilities that ensured the communication between the people in this century’s mode. This face-to-face nationwide experience I went hand in hand with marking his technical and online presence at the heart of the contemporary communication revolution, a civil engineer at the helm of the then nascent Egyptian blog sphere–in which he was and still is one of the most active elements. Wanting to write, another shift is made, this time a career shift, to the press, naturally enough, becoming quickly a prominent voice from a new generation of Egyptian journalists that took a special and fresh interest in observing the society at large and investigating its phenomena, breaking with the “conventional” press. His contributions to the the “Colours of Life” page in the Shourouk daily were mainly long and in-depth stories that belonged to a new kind of journalism in Egypt that he explored further in other outlets– Al Masry Al Yawm and Mada Masr for which he writes opinion pieces. For Amr Ezzat to become the one I know, he had to realize that one of the central questions in the Egyptian society is the social and political conflict around religion. He benefited from all the intellectual tools he acquired from jurisprudence, sharia, law and politics to become a religious freedoms defender, either by publishing reports and articles or moderating dialogues between the different conflict parties. He does all of that with the concern/thrust and endeavor of the researcher keen on – without falling into the indecent generalizations or structural illusions – exploring the authoritarian fallacies, debunking them on historical and logical grounds, and on observing the similarities between several small phenomena to come up with a general pattern that applies on many of them, reflecting the space-time stage in which it takes place. For Amr to become Amr, he had to be both so ordinary and exceptional, able of seeing the whole and the parts without one dominating the other and without reductionism or vulgarizing. For example he spoke of the ‘conditional accessibility’ as a state’s way of dealing with the islamists and the ‘cowardly daring’ as the way a group of the Egyptian opposition deals with the state. Or take his beautiful neologism; Sondokratia (Ballotocracy, Muslim Brotherhood era) about the elections that look democratic and independent from the outside while they don’t give a damn about democracy and all they do is absolve the state’s obligations towards the society. For Amr Ezzat to become the one I know, he had to be well-versed in logic, in the sense of the relations between concepts, and in syllogism, but also in argumentation and dialectic. He knows the art as it was founded by the great authors, namely the scholars of the seminal sources of jurisprudence, therefore becoming that argumentator, who doesn’t lose temper and doesn’t lose the thread of his argumentation. I refer here particularly – in addition to his writings – to the monthly “Forum of Religion and Freedoms”, which he organizes and moderates at the “Egyptian Initiative for Personal Rights”. Amr is also well-versed in rhetorics. For me, the most beautiful thing in him/he does is perhaps his language, and its rhetoric, in the sense that it is highly contemporary, ridiculously lucid, and at the same time able to address the most complex theoretical subjects. The contemporary here doesn’t only mean catering to the cultural taste of a targeted reader as much as it means the creation of the rhetoric moment itself. I remember Amr Ezzat describing the prologue of the current Egyptian Constitution – full with all kinds of ”obsolete” figurative language pomp – as “idiotic”. What I understood from that description is the harsh sarcasm in favor of another style. He knows that sarcasm is the figure of speech which can provide a headline for the historical moment we are living–he calls for that, writes that way, and perhaps this is how he lives. Wasn’t it him, who kept the locks of the bathrooms of the Tahrir Square when the revolutionaries invaded it, without any of them, nor even myself, recognizing how significant that way of recording the historical moment was. Could it be more ironic? Amr Ezzat is also columnist for Al-Masry Al-Youm and a human rights activist from Cairo. Amr participated in our Cairo Longform Workshop in 2015, whereof this longform “Room 304” evolved. We came to Istanbul at a crucial moment. It was in March, a few weeks before the referendum that would give the Turkish president Recep Tayyip Erdogan new and unprecedented power, furthering his fierce grip on the country, a sort of elected semi-dictator of the kind that are changing the face of politics all over the world at this moment in the early 21st century, taking shape in front of our eyes. Tensions were high between the German and the Turkish government at the time, our thoughts were with our friend Deniz Yücel, a German-Turkish journalist still in prison for doing his work on behalf of democracy and a free and open society, like to so many of his Turkish colleagues who are equally: locked up or threatened or pressured into silence. A sad encounter with a brave old city, that’s what we expected, Murat being originally from Istanbul and having talked to the officials at the German Foreign Ministry, sponsors of this project – but, rather surprisingly, the mood of the people we met, the writers, artists, activists we had invited to this workshop was different, they were open, unafraid, angry at times, but never despairing; giving in is not an option. We met in Galatasaray, not far from Taksim Square where the protests against the government had taken place in 2013, jolting a nation and a whole generation, and not far from the main shopping road where tanks were patrolling and police was everywhere – our host, Osman Kavala of the Anadolu Kültür Foundation had offered the lovely space of the Cezayir restaurant and conference space, an ideal place to focus on the power of stories, to listen and to learn. These three days, like the 60pages workshop we did in Cairo in 2015, were among the most moving, memorable and, yes, important that you can imagine: The trust, the energy, the talent, the inspiration, the courage, the humanity that brought together these people around their ideas, their projects, their proposals was a gift to us and a promise to the world that they would never be silenced. Each participant had roughly half an hour to talk to the others about the story he or she wanted to write, to engage with the group in discussing this idea, in changing, working, insisting – and the stories shared created a sense of community and of meaning in a time where both is often cruelly absent, community and meaning. All of the stories were great, we had to choose and commissioned eight. We will continue working with all of the writers and publish the eight longreads starting early in the fall. We will keep you updated on the progress and hope to engage you in our project. 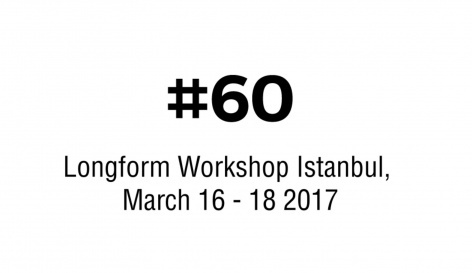 In March 2017 60pages hosted a three-day workshop with young journalists, writers and activists in Istanbul. We discussed the possibilities and the practice of long-form writing and identified five to eight relevant, surprising, necessary stories which could open up new perspectives on pressing political and societal questions. It was a safe space, it was a pop-up editorial board, it was a first getting to know each other and the beginning of a longer connection. The writings will be published on 60pages.com soon.